New York is one of the most disabled-friendly cities in the world. It has also made a large effort, in the past few years, to become accessible. New Yorkers are very attentive to people with disabilities and will often offer to help, wherever they can. I often get asked how accessible New York is, and can proudly say: quite! I decided to put all the information I have here, to help make your trip easier. Most public buildings, hotels, shops, in addition to many restaurants, are wheelchair accessible. Making this city a perfect place to spend your holiday. Below, you’ll find a list of different attractions and tips how to best plan your trip to New York. Many of the top attractions in New York are wheelchair accessible. Enjoy the views from the Top of the Rock, Empire State Building and the One World Observatory without a problem. They all have lifts, ramps and disabled toilets. Central Park is also, for the most part, accessible. So is the Brooklyn Bridge, from both the Manhattan and Brooklyn sides. However, the staircase that leads you to DUMBO is not wheelchair accessible. You can visit some of the New York’s famous museums, including the 9/11 Museum, MoMA and the Met, to name a few. Most museums in New York are wheelchair accessible. However, there are unfortunately some areas at the Intrepid Sea, Air and Space Museum and the Frick Collection that are not. Some museums even offer the use of a wheelchair, for free, for the duration of your visit. Taking a boat tour is a great way to see Manhattan’s skyline. At the time of booking, please check if the boat tour you are interested in says “accessible”. When filling in your details, leave a note in the “special requirements” field to say you’re a wheelchair user or you have a mobility problem. The staff will then make the necessary arrangements for the tour. A helicopter flight is a great way to see New York from a different perspective. The friendly staff will help you to get out of your wheelchair, (if you are in one), and in to the helicopter. You will be seated in the front, so will enjoy some amazing views of the city. Going to a sports game is a great thing to do during your stay in New York. All stadiums are wheelchair and disability accessible, so get ready to cheer on your favourite team! Erics Tip: If you have tickets for a sports game or concert at Madison Square Garden, head to the 8 Penn entrance, located on 33rd Street and 8th Avenue, for priority access. If you are interested in riding a bike while in New York, the electric bike tour might be a nice option for you. 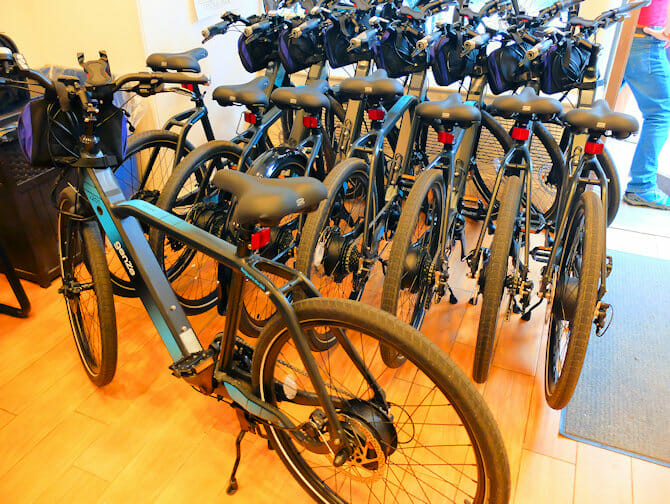 You tour the city on a pedal assisted electric bike, making conquering the hills of Central Park and the streets of Manhattan way easier. Broadway theatres in New York have been adapted and become much more accessible, in recent years. There are an increasing number of services dedicated to visitors who have a disability. Send me an email at eric@newyork.co.uk if you would like me to help you find wheelchair accessible seats for a Broadway show. Most theatres have at least one wheelchair accessible entrance/exit. In addition, most of the newer theatres have lifts. Accessible seats are usually located in the rear of the orchestra section. So, to be sure of getting these seats, contact the theatre in advance to see if they are available. Some of the shows are interpreted in American Sign Language and often there are captions available during the show.For more information contact TAP (Theatre Development Fund’s Accessibility Programs) : +1-212-912-9770 ext. 382. If you are blind or visually impaired you can still enjoy a Broadway show. Describe! is a service that helps you follow the show via a special audio device and live commentary. For more information contact HAI: +1-212-284-4100. You can rent a private car to transfer from the airport to the city. CarmelLimo provides adapted cars to help make your transfer as easy as possible. When booking, select the option “I will need a wheelchair accessible vehicle”. Always book the transfer in advance as these vehicles are limited. More information about travelling to and from the airport for the disabled can be found here. Buses are especially wheelchair friendly. In addition, most subway stations have lifts. However, sometimes the lifts can be out of order. So, the bus is a safer, more convenient way to travel. There are 110 disabled-accessible subway stations in New York. This means they have a lift, and MetroCard vending machines and entry gates are also wheelchair accessible. Bear in mind that the smaller stations may not be accessible, and, even in an “accessible station”, lifts can break. For a hassle-free holiday, I would recommend taking the bus over the subway, whenever possible. Here is a list of accessible subway stations in New York. 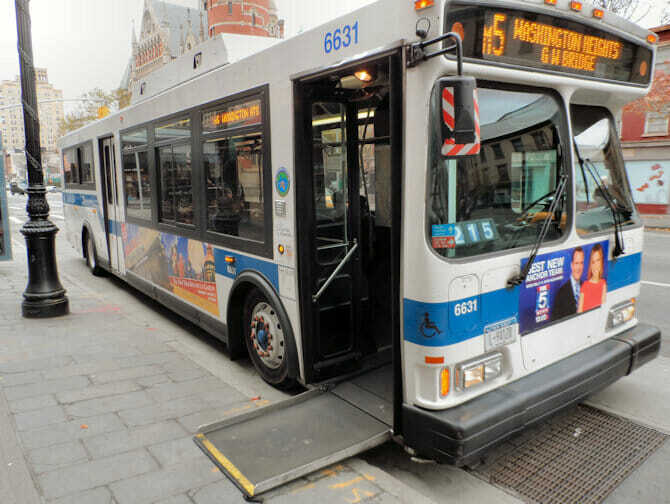 Buses in New York are fully accessible and a good way to get around the city. All buses have ramps, so anyone with reduced mobility will be able to get on, without a problem. Traffic can be quite dense in New York, so buses tend to be slow, compared to the subway. If you are in a hurry, hail a taxi instead. Taking a Hop on hop off bus is one of the best ways to explore the city. Some hop on hop off buses are fully accessible and good value for money. So, many people with reduced mobility use them for getting around New York. Even though you won’t be able to get to the top deck, the bottom deck does allow you to see the city. Are taxis in New York adapted? Generally speaking, no, but don’t be discouraged! Most drivers will be happy to help you get in to the vehicle. If you’re in a wheelchair, your driver will make sure that it’s properly stored in the boot. Carmel are a reliable transportation service in the city. When making a reservation with them, you can request a wheelchair accessible vehicle. They provide airport transfers, in addition to rides within Manhattan or to and from other boroughs. If you need to travel to and from New Jersey, you can make use of the PATH-trains. The major stations are wheelchair accessible; including 33rd Street, World Trade Center, Hoboken and Newark. There are several places in New York where you can rent a wheelchair. You can rent manual and electric wheelchairs, mobility scooters, crutches and walking aids online at Chelsea Mobility & Medical Equipment. 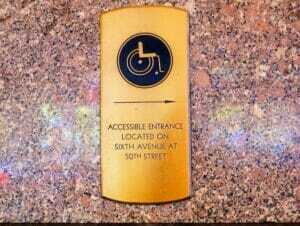 Carnegie Hill Pharmacy Broadway is also a good option for renting a wheelchair. It’s just a stone’s throw from Columbus Circle, and even has an international pharmacy on the premises. If you are looking for a wheelchair accessible room, Hotel Beacon is a good option. This hotel, located in the Upper West Side, has a good number of rooms that have been adapted for people with limited mobility. There are also a number of subway stations in the neighbourhood and 72nd Street Station (close to the hotel), has a lift.